About 150 people crammed into Walter Reed Community Center last night to discuss the current state of planning for the Columbia Pike streetcar project. Planners revealed that the streetcar line is expect to go into service in 2016 and is expected to cost $160 million to build. Of that, Arlington will pay $135 million and Fairfax County will pay $25 million, according to planners. However, county staff warned those cost estimates will change as further planning is done. The Pike Transit Initiative, as the project is called, is also seeking funding from the Federal Transit Administration, which could cover part of the cost of construction. The streetcar would travel east from Skyline/Bailey’s Crossroads, down Columbia Pike, past the Air Force Memorial to end at South Eads Street. The plan also calls for one of two extensions to be built, either to the NOVA Community College campus near Skyline or to Long Bridge Park, near the Pentagon, to accommodate a streetcar storage and maintenance shed. The public forum was expected to be contentious, as a number of streetcar critics had announced in advance they would attend. There were no fireworks or shouting matches, but during a question and answer session a few people did pelt planners with questions about the value of having a streetcar line at all. 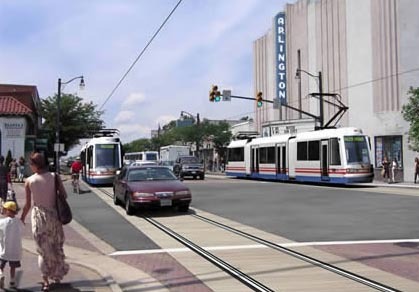 Steven Del Giudice, head of transit operations and planning for Arlington County, suggested that there were other means for critics to express their dissent and that this meeting was “not the forum” to discuss the value of having streetcars on the Pike. “Reasonable people can disagree,” said Del Giudice after the meeting, shrugging off the criticism. Streetcar skeptic and Pike resident John Antonelli said he was concerned about the project’s cost, which some critics believe could reach past $300 million (Del Giudice disputed this, saying a quoted $336 million figure included 30 years of operating costs). “The impression I got was ‘thank you for you comments, we will now do what we want to do,'” Antonelli said. Still, most of the audience seemed supportive of the project. During the break-out session, attendees huddled over maps of the Pike with streetcar project staff to suggest station placements and other ideas and modifications of the plan. The next phase of the project will be an environmental assessment of the line and all of its proposed options. In order to comply with federal law when completing the assessment, the county will look at alternative options for each section of the proposed streetcar line. The options are: “do nothing,” which would leave the Pike essentially in the condition it’s in today; “low cost,” which would incorporate significant improvements to the bus lines going through the Pike; and the full “streetcar option.” The county expects to have the assessment done by spring 2011. The author runs the People-Powered Arlington blog. Rendering via Pike Transit Initiative.